The last few weeks have been really busy for me with outside work coming in, but I have been spending all of my free time watching netflix swatching some really interesting patterns. Usually I design knits with overall shape in mind, not lace or cables and complex textures. To make things interesting, I decided to look at Missoni style textiles. None of these are copies of commercial knits, their machines do things that hands can't, but in studying the technology , I have come up with my own new ideas. Here are some of the stitch patterns that I have made using stripes. 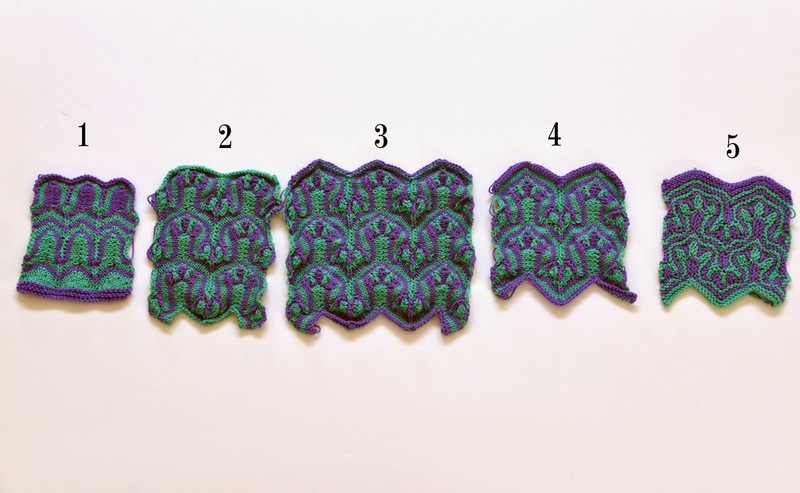 each pattern is worked with one color per row, yet they look a lot like stranded motifs. the advantage is that there aren't any messy loops on the wrong side, making them great for shawls, wraps, and blankets. 1. 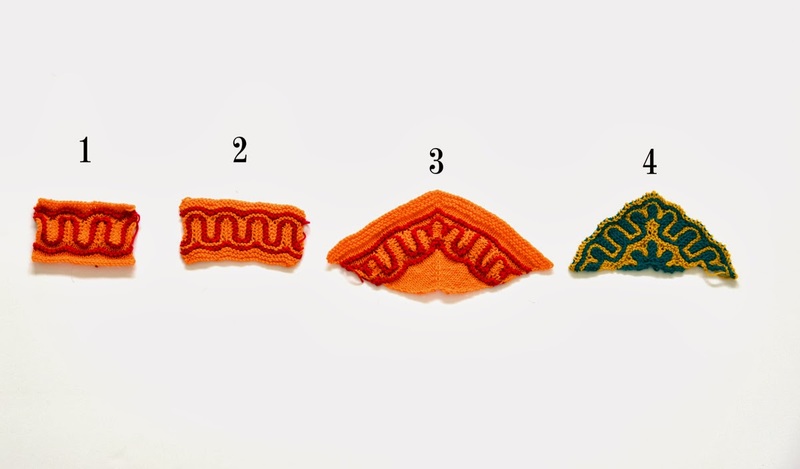 This is how the idea started, extend chevrons vertically, lobes will form. 2. Put lobes on the lobes and it will look even cooler. 3-4. Alter the pattern slightly to try to flatten the fabric. 5. Garter stitch makes everything fit together perfectly and lay flat. I amgoing to make an afghan in this pattern and I am working on a wrap with this as well. 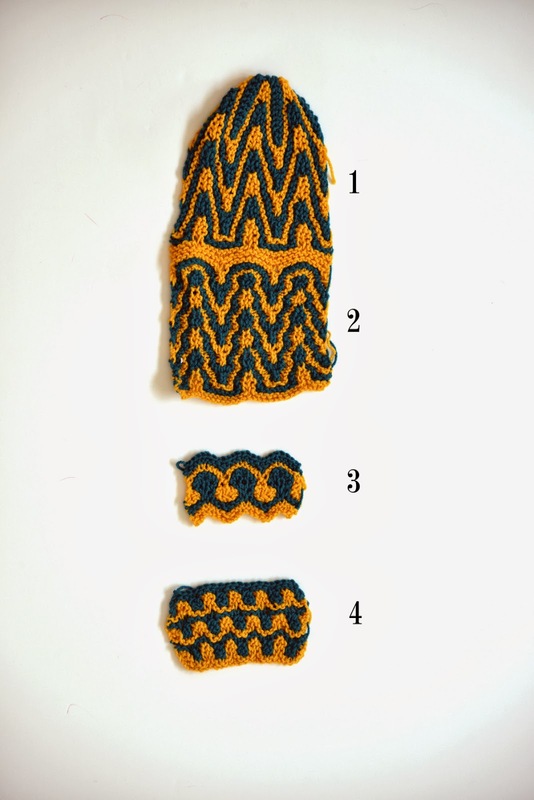 These look super hard to knit, but in reality, they are just glorified chevron patterns with increases and decreases - no harder to knit than any other stitch pattern. 1-2. I am looking at ways to make deeper chevrons, you can expect a detailed post about the number of increases and decreases to make all sorts of chevron patterns as soon as I have time to knit examples. #2 has waves along the chevrons as well. 3. This is a border pattern. It looks cool, but it has short rows in addition to incs and decs. Ain't nobody got time for that. 4. Lobes - loving these lobes. They are easy. You'll see these in a scarf design. 1. I am working on a triangular shawl and thought this would be a good border. 2. Yet againn, everything lies flatter in garter stitch. 3-4. These are center and corner experiments for the shawl. I am feeling very good about it right now and the pattern should be ready in august. That's what I have been knitting these days. For now, I am keeping my technique secret until I release the patterns. It's difficult to write because they should be chartable, but most are not due to the change in stitch count from row to row. Maybe I will need test knitters next month. Any interest? Those are all very beautiful. I would live to be a test knitter. I would be interested in doing a test knit! I love your designs! These are amazing! I love seeing the various iterations. very cool! These would be great bracelets. Hi Xandi, here you've got a test knitter eager to test knit your gorgeous patterns. Just let me know how we'll go about it. I have a list of volunteers, when I need someone, I send out inviations to people who look like they are up for it. Right now, I am not looking, but will let you know if I have an open project.